Just when I think I'm immune to the brutality, Sons of Anarchy Season 7 Episode 7 comes along and proves me wrong. 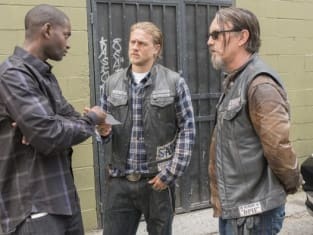 However, I did guess correctly when I said in last week's Sons of Anarchy round table that I thought Jax would give Juice a chance at redemption by sending him into prison to kill Lin. Although Juice could have been a bit more cautious in his methods. Shooting at a bunch of cops seems like a good way of getting yourself killed instead of ending up under arrest. Thankfully, it all worked out the way he'd planned. I also found it interesting that the club dropped Juice off at the spot where JT was killed. At least I'm assuming that's what those initials and that date on the rock meant. It had me checking my calendar to see if there was a new episode of Sons of Anarchy scheduled for the upcoming November 13. There isn't. The date falls on a Thursday. Gemma was an emotional mess as she waited to find out if Juice had ratted her out. One moment she's dismissing Wendy's concerns about Abel, the next she's hugging Unser and asking for forgiveness. Speaking of Unser, he is quietly piecing it all together but will figuring out the truth be the thing that destroys him? It was heartbreaking watching Nero ask Gemma to go with him to the farm to start a new life. A safe, sane life. The man had tears in his eyes. He'd happily take on Jax's boys and probably anything else she'd ask of him to give them a chance. He truly loves her, probably more than any other man in her life ever has. Oddly, there's a part of me that wishes it could be that simple. That the two of them could move away and start over but that's probably more for Nero's sake than Gemma's. Gemma needs to pay for her sins and when that happens, it's going to crush Nero. When Happy came to take Gemma to the cabin, her paranoia over Juice had her expecting the absolute worst. When she confessed killing Tara to little Thomas I expected Wendy to overhear her…not Abel! That poor kid is going to be such a mess. Is it possible that he could be the one to take out Gemma in the end? As disturbing as that would be, on this show anything is possible. It wouldn't have surprised me at all if Gemma had shot Happy and Ratboy in the cabin before she knew about the junkie mother she was supposed to help. She was that jumpy. Nero: What do you want with Greensleeves or shouldn't I ask? Chibs: Just want to talk to the fella. Nero: Yeah, a semi-automatic discussion? Permalink: Yeah, a semi-automatic discussion? Adam Greenblatt was such a sleaze, I can't say I minded when Jax helped him with his sloppy suicide. But when I saw Bobby driving alone in that old station wagon, I knew things weren't going to end well. August Marks isn't the kind of guy to do his own dirty work. He has his own private security team to do it for him. When Moses Cartwright stepped out of the car with that box, I knew there was something very, very bad inside. It was too small to be a head but I never would have expected the original member patches…or the eye. Just when Jax had decided to use leverage instead of bloodshed, August pushed back and there's little doubt that there's nothing but carnage to come. What's Jax next move in this ceaseless game of mutually assured destruction? I don't know but with only six episodes left, I'm definitely going to watch. 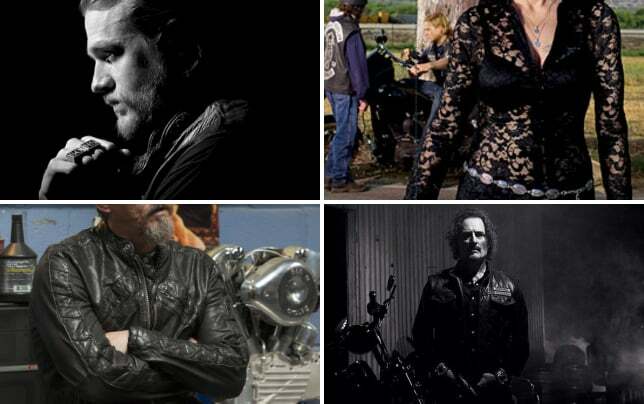 Don't miss a minute of the mayhem, watch Sons of Anarchy online here at TV Fanatic. 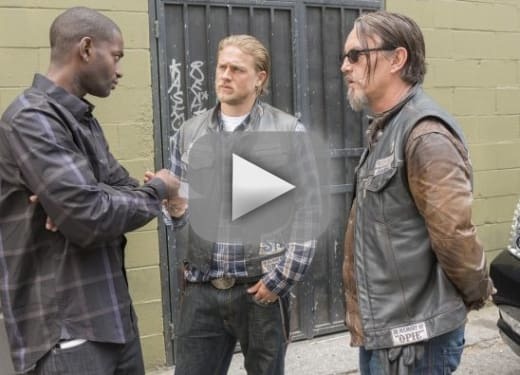 Here is your first look ahead to Sons of Anarchy Season 7 Episode 8, "The Separation of Crows."